Today I have an interview with Eric Mersmann and Jeffrey Dieterle about My Jam, a live action game currently on Kickstarter! It's very musical, and a unique kind of empowering. Check out their responses below! This image, done by Lawrence Gullo, is so powerful! Tell me a little about My Jam. What excites you about it? My Jam is a one-shot 4-hour larp where you embody high school aged musarchs—people who gain magic power from their relationship to music—during the biggest dance of the year. 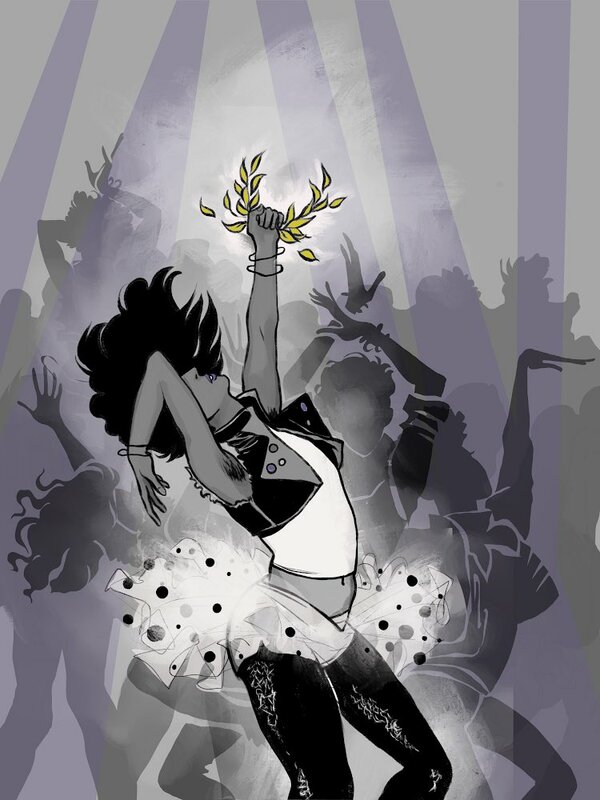 During the dance, your song will come on and you'll be the deity of the dance floor for its duration. A whole lot excites me about this game! We've been working on it for over a year (our first playtest was at Metatopia 2017) and people seem to get a real rush out of it! The most surprising thing to us was people coming up to us after playing who HATED high school dances and told us that this really gave them the experience they wished they had! It kinda empowers players over something that might not have been such a positive thing at the time. At the same time, folks who LOVED high school dances also said they enjoyed this game so yeah! Music! Magic! Drama! What's not to be excited about!?!?! What inspired My Jam, and what was the path like from inspiration to reality? How did you design the game to be approachable and fun for all the different types of players? WORKSHOPS!!! We have about an hour of pre-game that's intended to help people get into their characters and start moving around in response to music. Unfortunately, My Jam is not for everyone, but we've worked really hard to make sure it's for as many people as possible and that the people who do play it are able to enjoy themselves. We've tried to take some of the worst parts of high school dances out while still keeping the drama and emotional intensity. And finally, we reinforce that the players are more important than the game and we give the players some tools to help and empower the palyers to mediate their experience. How do you handle safety and consent when you have music playing? Do you find players are more free with their movement and action with an environment framed like this? 1) touching only with consent - this is especially important for dancing, and people have a lot of baggage around being explicit asking for consent so we try to cut through to say that touch should only happen with consent and consent is an ongoing process. 3) rivalry without hate - this game is meant to capture the feelings of highschool but we're not interested in giving people an excuse to practice abusive or oppressive behaviors so we forbid role playing oppression-based bullying. We also recommend making sure that the volume of the music is loud enough to dance to but still quiet enough to talk over and we also recommend having a space where players can be free of the magical powers: a circle of protection/chill-out zone. Our experience is that with the warm-up workshops and the safety it allows players to embrace their bodies and music with less fear of judgment. There's definitely an added level of vulnerability, but we try to instruct the facilitator in how to create an environment where people can experience that vulnerability. So far our players have reported back success! Your Kickstarter approach seems a little different from other Kickstarters. Why are you approaching the model differently, and what do you expect to see from it? We went around and around on what the final form of My Jam would be. At one point we were discussing pressing an audio version of the workshops into vinyl! At the other end of the spectrum we considered putting out a simple pdf. With a little introspection, we realized the thing we wanted more than anything was for as many people as possible to have the game. After that we wanted the game to be uh "cool" for lack of a better term. Hence doing a zine. This let us keep production costs low (keeping it accessible) but still gave us the freedom to experiment with layout and printing styles and create an artifact that was kickstarter-only. We worked with an artist Lawrence Gullo (@hismajesty on twitter) who had played the game to make some cover art and other assets (like the cool moon/records we use on the kickstarter page.) This way the fixed costs were pretty low, enabling us to keep our target low. Luckily we hit it pretty early, and we now have a nice little margin to add more art. We're not doing stretch goals per se, we're keeping everything about those two goals: get the game to as many people as possible and make the game artifact as cool as possible. We had discussed stretch goals (guidelines for how to play as a 50s sockhop! cyberpunk dystopia My Jam!) but ultimately these things felt like distractions. Then we started adding silly jokes. Sometimes we worry that the jokes make people think that we don't take the game seriously, but it's more like we take it SO SERIOUSLY we needed to fill our campaign with jokes just so we could breathe!!! We're hoping that our love for the game and for larp shines through and attracts other people who might feel similarly. So far, so good we guess!!! Thank you so much to Eric and Jeff for the interview! I hope you all enjoyed learning about My Jam and that you'll check it out on Kickstarter today!